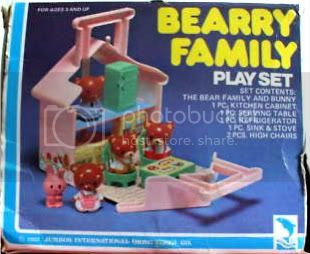 DESPERATELY WANTED: Bearry Family Playset (1982). Reward offered! I've been looking for this playset for years without even knowing its name or having a picture of it... Just with my childhood memories! 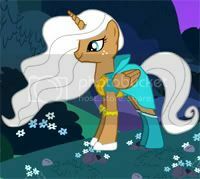 Now thanks to the Ghost of the Doll Toy ID Forum I finally have a name and an image of it... If anyone out there has one like this and want to sell it or knows of anyone who's selling one like this, please let me know! Thank you in advance! 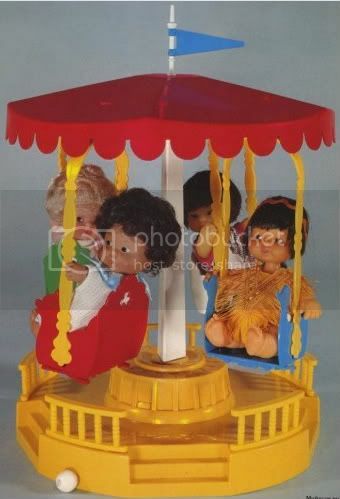 Re: DESPERATELY WANTED: Bearry Family Playset (1982). Reward offered! I have found one on Ebay Uk!!! Think she only ships to UK, and not sure where you are, but I could always bid on it for you if you covered the costs, and then I could send to you? Thank you so much for your reply, funkyfifi! Yes, indeed it is the same photo, I "stole" the picture from that ebay auction... The seller only ships to UK and I'm located at Venezuela. I also have a P.O. box in Miami (from a private courier company I hired to manage all my internet shopping at the United States), so it can be shipped there. I send the seller a message asking if he or she could make an exception and ship the package to the USA, I hope the answer will be yes. If the answer is no, I'll return to you so you can bid on it and then I´ll pay the auction with my paypal account (and of course, also the later postage to Miami). Thank you so much for offering to this, you are so kind and generous and I really appreciate it! No Problem! I know what it is like when you are desperately seeking something! I have some holy grail Care Bears which I am looking for, but will never get! Hi! I wanted to let you all know that I won the playset!!! You can't immagine how happy I am!!!!! Finally the last day the seller opened the auction to international buyers and I was able to bid. I was afraid that anyone outbids me, 'cause I had to travel precisely the night before for work reasons, but my husband kept an eye on the auction on my behalf and at the end no one else made a bid, so I won. I'll be paying to the seller as soon as I get home (I return this night) and I hope to have the playset on my hands in two or three weeks (it has to go first from england to miami, USA, where I have my P.O Box, and then to Caracas, Venezuela, where I live). I think I'll cry when that finnally happens. Maybe I'll post a photo here of me with the playset! I'm glad you found one!!! How exciting!